An athletic, 35 year-old male presents to the office four months after suffering an ankle sprain while playing soccer. In spite of a period of immobilization and a course of physical therapy, he has had continued pain and stiffness localized to the ankle joint. He has been wearing a lace-up ankle brace, icing the ankle and taking OTC NSAIDs. A physical examination reveals mild tenderness upon palpation to the ankle joint line but there is no significant pain along the medial or lateral collateral ligaments. He has a negative anterior drawer. Routine X-rays are negative. A subsequent MRI shows an osteochondral lesion on the talar dome. How should one proceed? Osteochondral lesions of the talus (OLT) are routinely missed in the early workup and treatment of impaction or rotational ankle injuries. Keep in mind that ankle sprains are commonly under-treated and often will not end up in a foot and ankle specialist’s office until the condition has become chronic and persistent. Frequently, a clinician will make the diagnosis of OLT after the patient has already experienced several months of pain. OLTs involve an injury to the articular cartilage with or without subchondral fracture, and lifting or separation of the fragment from the underlying subchondral structure. These joint injuries can occur throughout the body but occur most commonly in the knee. Osteochondral lesions are not restricted to a traumatic etiology although this is the case in the majority of patients. In some cases, they are caused by a poorly understood ischemic event. 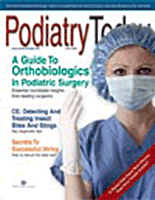 Clinicians commonly see OLTs at the anterolateral or posteromedial talar dome. Anterolateral lesions are usually the result of an inversion injury and dorsiflexion forces, causing a shallow and wafer-shaped lesion. Medial talar dome lesions are usually deeper and cup-shaped. They are usually the result of plantarflexion, inversion and external rotation. Patients with OLTs will usually have a history of inversion injury but keep in mind that spontaneous necrosis can occur without a history of trauma. These patients will usually describe joint stiffness, pain on range of motion and attempted activity, and catching or locking of the ankle. A routine ankle examination can reveal pain on range of motion. For an anterolateral joint lesion, plantarflex the foot and palpate at the anterolateral aspect of the ankle. When it comes to posteromedial lesions, one can elicit pain by palpating the posterior medial aspect, just behind the medial malleolus, with the foot in full dorsiflexion. Berndt and Harty classified osteochondral fractures of the talus based upon radiographic findings. The options when dealing with OLT are dependent on the location, size, depth and staging of the lesion. With this in mind, here is a suggested treatment approach to a variety of lesions that we may see. Stage I lesions. A patient of any age presents with ankle pain after a traumatic injury, has negative X-rays and MRI findings that are consistent with a shallow, compression type lesion of the talar dome with subchondral edema. There is no associated tibial plafond injury. In these cases, one should emphasize a four-week period of immobilization and non-weight bearing status. The patient may subsequently initiate physical therapy and gradual weight bearing as tolerated. If the patient fails a course of conservative treatment, consider ankle arthroscopy if the lesion is anterior. Posterior and posteromedial lesions are difficult to access without medial malleolar osteotomy. Palpating the lesion can reveal if the chondral surface is firm, soft or loose. Small to medium stage II lesions. These patients may present with a recent history of ankle injury with persistent pain and may sometimes describe catching or locking of the ankle injury. Radiographs may or may not show a talar dome defect but MRI findings should be consistent with a talar dome lesion. Arthroscopy may be helpful in these cases to visualize the lesion better. Partially detached pieces of cartilage may heal very well if there is an attached piece of subchondral bone. If it is just a flap of cartilage that has lifted from the subchondral bone, one may perform arthroscopic debridement with drilling of the subchondral bone. The drilling can help promote revascularization and stimulate repair with fibrocartilaginous tissue. This can potentially remodel and avoid the step-off defect in the joint surface that would otherwise accelerate arthritic processes. The fibrocartilaginous scar tissue is significantly inferior to the hyaline cartilage of normal healthy joints and reportedly does not prevent the onset or progression of degenerative arthritis. Nelson and Haycock have described performing arthroscopic-guided retrograde drilling in order to avoid damage to the other side of the tibiotalar articulation. In chronic cases with persistent pain, one may consider ankle joint replacement substitutes (i.e., Supartz injections, Smith & Nephew). Although the Supartz injection is not yet approved by the FDA for treating ankles, it is a nice adjunctive therapy that can postpone the need for joint replacement or arthrodesis. What About Stage III And Stage IV Lesions? Stage III lesions. Early detection and treatment can facilitate better outcomes with these patients. When one sees a patient several months after he or she has had the causative injury, the patient will have little chance of healing with conservative treatments. Ideally, clinicians should emphasize early immobilization and non-weightbearing. If the lesion shows lifting from the subchondral bone, even though it remains in the crater, consider early surgical intervention to avoid avascular necrosis of the fragment. A difficult to reach lesion may warrant an attempt at conservative management but when it comes to easily accessible anterolateral lesions, one should strongly consider early surgical repair. The Arthrex chondral darts provides a very nice delivery system for ORIF of these lesions. However, keep in mind that the system requires placing the dart approximately perpendicular to the talar dome. Therefore, any lesion past the middle of the dome is very difficult to fixate. Small to medium stage IV lesions. This patient will usually be in significant pain with attempted motion of the ankle joint although it is dependent on the size of the lesion. MRI will show the defect and likely identify the displaced fragment. One should treat larger lesions with early ORIF. Smaller or irregular fragments are more difficult to reduce and fixate. When it comes to smaller lesions of less than 3 to 5 mm, one can consider extirpation with subchondral drilling. Large, stage IV lesions without reducible or repairable fragment. In order to repair these lesions, one should consider the OATS (osteoarticular transfer system) procedure. Alternatives include an autologous chondrocyte transfer (ACT) usually from the ipsilateral knee, debridement with drilling, joint replacement injections and delaying surgery until the patient may be a candidate for ankle joint replacement. ACT is a well documented procedure with the potential for donor site morbidity. The benefit of using the OATS procedure is that it allows one to achieve a more anatomic repair with the transfer of a lateral shoulder of the talus. One can consider a mosaicplasty technique for large lesions. This technique, which has been developed and popularized over the last 15 years, includes replacing the cartilage defect with multiple, small osteochondral cylinders instead of a large, single block. Chronic OLT. In the cases of chronic osteochondral lesions that are doing poorly, one should tailor the repair to addressing whatever level of pathology is present. When it comes to large lesions with degenerative joint changes, one should consider arthrodesis for the most predictable outcomes. However, clinicians may consider attempting an OATS or ACT procedure, or even an ankle implant arthroplasty. Dr. Baravarian is Director of the Foot and Ankle Institute of Santa Monica. He is an Associate Professor at UCLA Medical Center and is the Chief of Podiatric Surgery at Santa Monica/UCLA Medical Center. Dr. Franson is affiliated with the Foot and Ankle Institute of Santa Monica. 1. Berndt AL, Harty M: Transchondral fractures (osteochondritis diseccans) of the talus. JBJS 41(A): 988-1020, 1959. 2. Canale ST, Belding RH: Osteochondral lesions of the talus. JBJS 62(1): 97-102, 1980. 3. Hangody L: The mosaicplasty technique for osteochondral lesions of the talus. Foot Ankle Clinics 8(2): 259-273, 2003. 4. Nelson SC, Haycock DM: Arthroscopy-assisted retrograde drilling of osteochondral lesions of the talar dome. JAPMA 95(1): 91-96, 2005. 5. Schafer DB: Cartilage repair of the talus. Foot Ankle Clinics 8(4): 739-749, 2003. 6. Whittaker JP, Smith G, Makwana N, Roberts S, Harrison PE, Laing P, Richardson JB: Early results of autologous chondrocyte implantation in the talus. JBJS, Br 87(2): 179-183, 2005.